Pumpkin Cheesecake is the number one fall dessert recipe for cheesecake lovers! Pumpkin Pie is always a favorite, but I know if given the option I would choose pumpkin cheesecake. The hardest part is choosing what crust and topping to pair with pumpkin. For this recipe instead of making a single big cheesecake I went for three mini versions. Each with their own flavor profile. 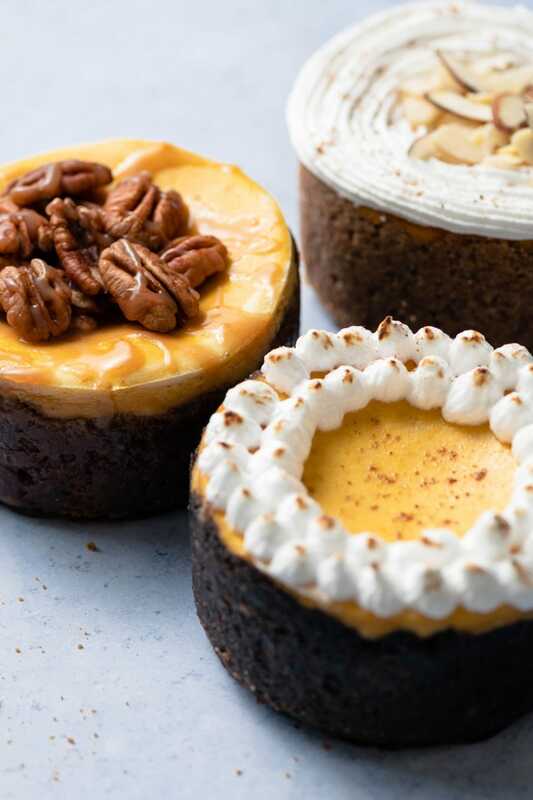 Combining pumpkin with chocolate, almonds, coconut, gingersnaps, pecans, walnuts, caramel, meringue, and vanilla frosting to make a trio of delicious desserts. You can make more flavors! Having a party? These are perfect for slicing into bite size portions. Mini Cheesecakes bake quicker than large cheesecakes. If you ‘accidentally’ eat a whole one, its only like having 1 big slice of a real sized cheesecake. The following list of items includes affiliate links. I recommend all of the products listed because I own and use them on a regular basis. I chose to use Wilton Springform Pans because of their quality, ease of removing cakes, and perfect mini size. After searching for mini pans, I found these to be the best on the market and I use them for regular cake recipes as well! 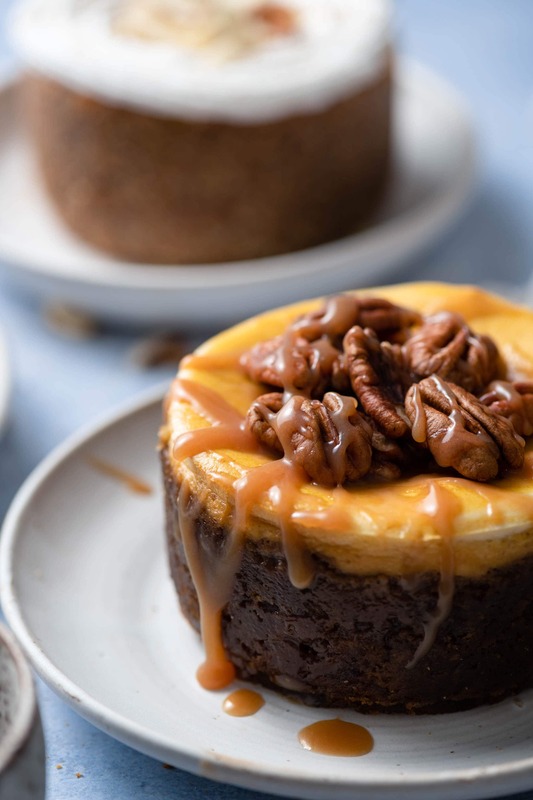 The first mini cheesecake is a swirl of vanilla and pumpkin filling with a honey gingersnap cookie crust, topped with caramel and pecans. 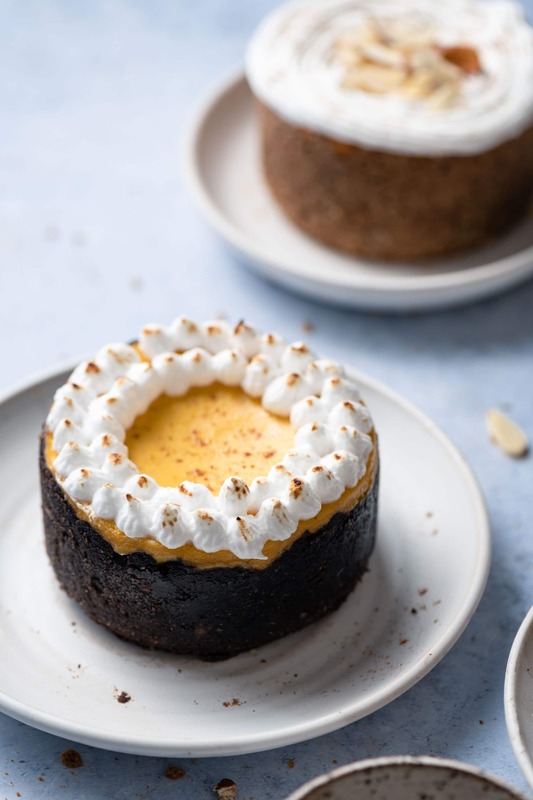 The second mini cheesecake is pumpkin filling with a blended chocolate coconut almond crumble crust, topped with toasted meringue and sprinkle of pumpkin spice. 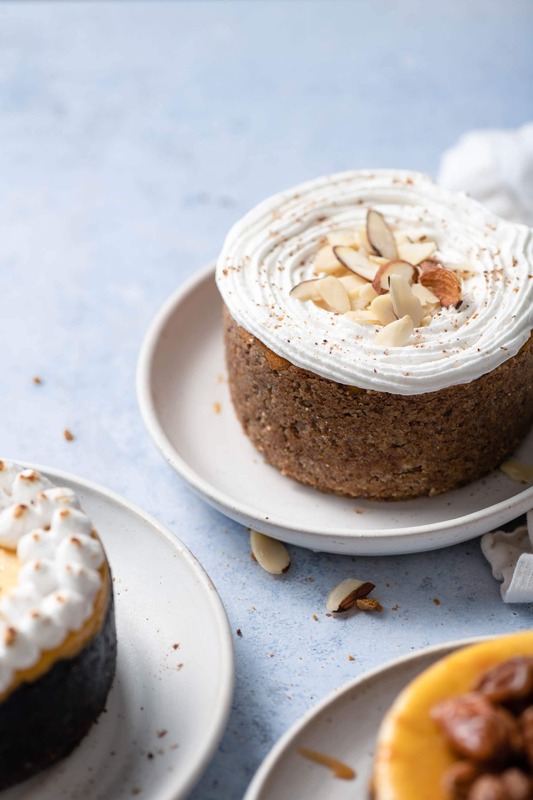 The third mini cheesecake is pumpkin filling with a maple sweetened almond walnut crumble crust, topped with toasted vanilla frosting and sliced almonds. Use room temperature cream cheese. I will set my cream cheese out on the counter three hours before baking. Cold Cream cheese will leave you with chunky curdled cheesecake, GROSS! Remove 1/4 cup of the vanilla cheesecake filling before adding in the pumpkin puree. You will use this for the pumpkin swirl. Take a spatula and scrape the sides and bottom of your mixing bowl to incorporate all the cream cheese. Use a food processor or blender to make nut and cookie crumbs. Be careful when adding your melted butter. I pour and stir it into the crumbs slowly. If you add too much butter, your crust will be soggy and won’t hold its shape. Spoon your crust mixture into the spring form pan and gently press across the bottom and up the sides. I chose to have crust all the way around the sides of my cheesecake. 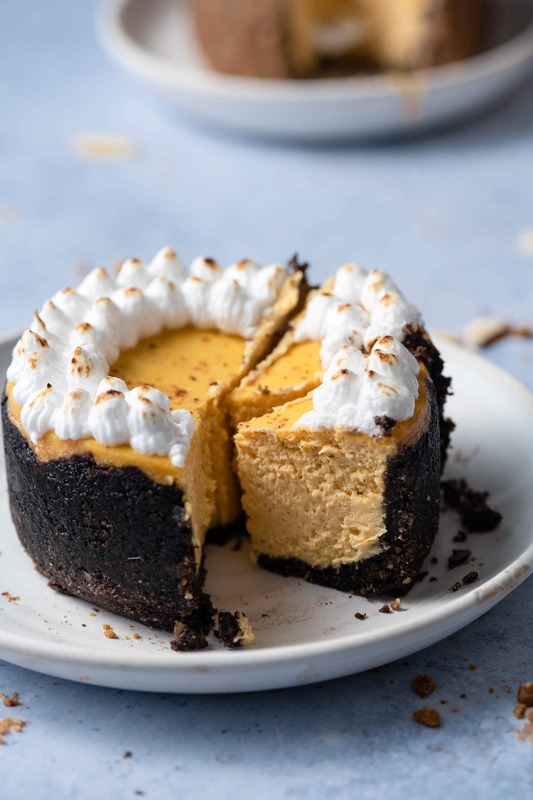 If you just put crust across the bottom, the cheesecake may lose its shape and look less desirable for decorating and serving. Whip your egg whites, salt, and cream of tartar while your sugar is melting on the stove. Slowly pour your hot sugar mixture into the egg whites with the mixer on medium high. Spoon meringue into your piping bag and decorate immediately. Lightly brown the tips of your piped meringue with a kitchen torch. 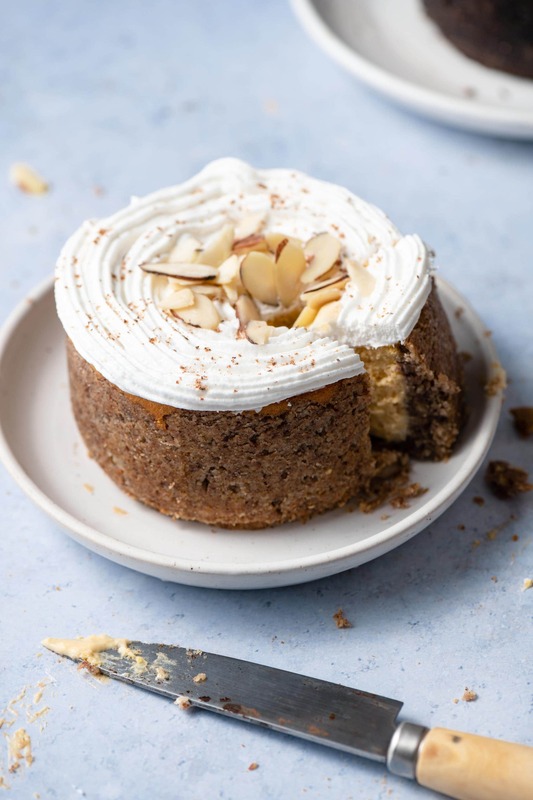 Check out this Recipe for Poached Pear Cardamom Cakes also using Mini Springform Pans! Visit Wilton for some Autumn Project Ideas! 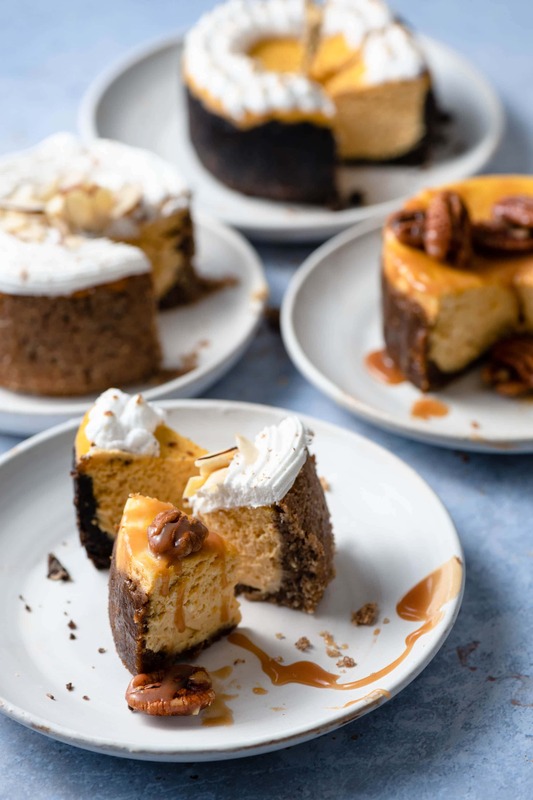 Mini Pumpkin Cheesecake made with three different crusts. Gingersnap Crust, Chocolate Coconut Crust, Almond Walnut Crust topped with caramel, toasted meringue and vanilla frosting. Preheat oven to 325 degrees F. Spray baking spray on sides and bottom of springform pans, then line bottom with parchment paper. Set out 3 different small bowls. Separately blend the dry ingredients for each crust and pour each combo into its own bowl. Then stir in sugar or sweetener. Lastly slowly add melted butter until desired consistency. Crust should be moist and easy to pack. Overly wet crust with lots of butter that is gooey will result in a soft crust. Crust #1: Place gingersnap cookies into a food processor or blender until crumbs form. Pour crumbs into bowl. Stir in honey. Slowly pour in melted butter, stirring with a spoon until well mixed. Crust should be wet but not soggy. 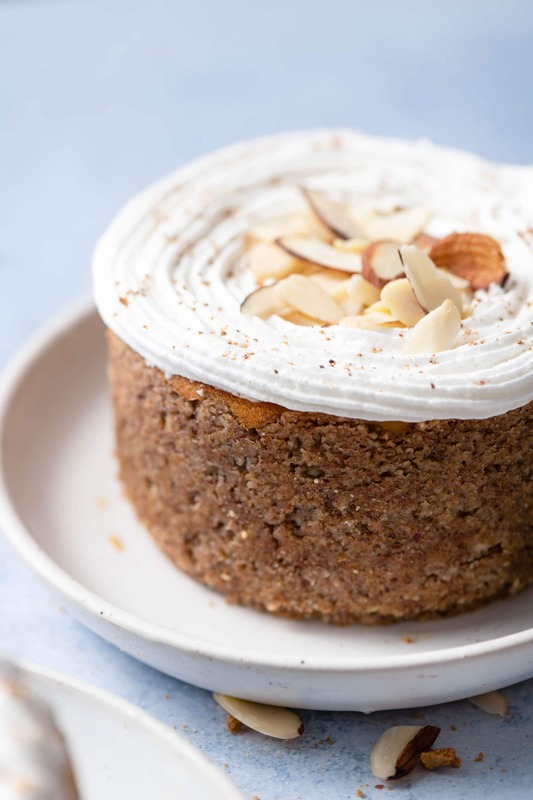 Crust #2: Blend almonds and shredded coconut together using a food processor or blender until crumbs form. Pour crumbs into bowl. Stir in cocoa powder. Slowly pour in melted butter, stirring with a spoon until well mixed. Crust should be wet but not soggy. Crust #3: Blend almonds and walnuts together using a food processor or blender until crumbs form. Pour crumbs into bowl. Stir in maple syrup. Slowly pour in melted butter, stirring with a spoon until well mixed. Crust should be wet but not soggy. Fill each springform pan with its individual crust. Gently press crust across bottom and evenly up the sides of pan. Beat together cream cheese, sugar, vanilla and eggs. Once evenly blended, remove 1/4 cups of batter and place in separate bowl. Next add pumpkin puree and the spices to mixer bowl. Blend thoroughly. Now you should have a mixing bowl of pumpkin batter and a separate ¼ cup with vanilla batter. 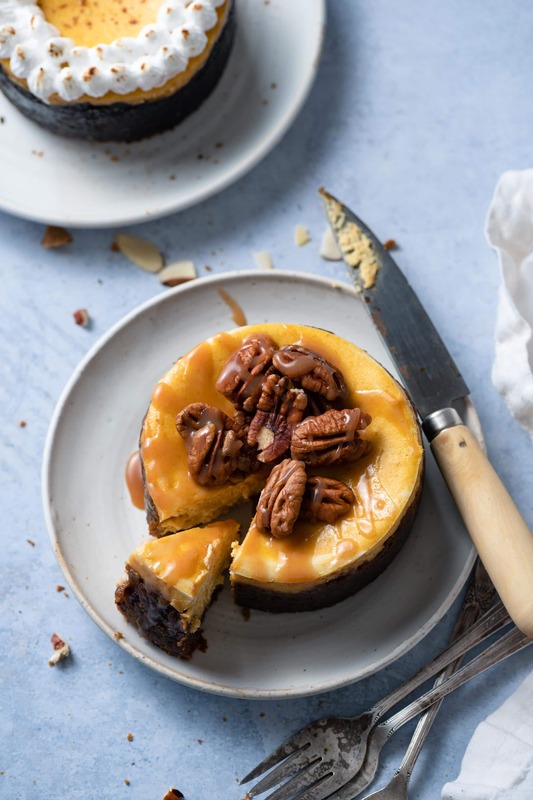 Fill Chocolate Crust and Walnut Almond Crust with Pumpkin batter. 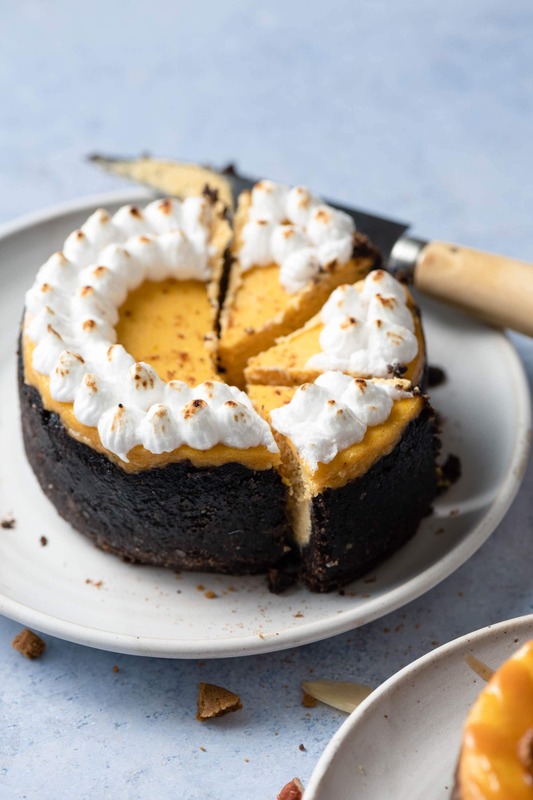 Take the Gingersnap crust pan and fill ¼ full with pumpkin batter. Spoon 1 Tbsp of vanilla batter on top and gently swirl with toothpick. Repeat until crust is full. Place all three cheesecake pans onto a cookie sheet. Bake cheesecake for 20-25min. or until there is only a slight jiggle in the very center. It will finish setting while on the cooling rack. Cool completely on rack and then chill in refrigerator for a minimum of 4 hours. Place egg whites, salt, and cream of tartar in bowl of stand mixer. Using whisk attachment on medium high, beat soft peaks form. Place water and sugar in a small sauce pan on stove top. On medium heat stir gently and allow to come to a soft boil. Once sugar is dissolved, remove syrup from heat. While mixer is on medium high, slowly pour warm sugar syrup into egg whites. Continue to beat until stiff peaks form. Spoon meringue into piping bag. Pipe desired amount of meringue onto cheesecake. Lightly toast meringue using a kitchen torch. Follow directions of Box of Wilton Vanilla Frosting Mix. Spoon frosting into piping bag with desired tip. Pipe desired amount of frosting onto cheesecake. 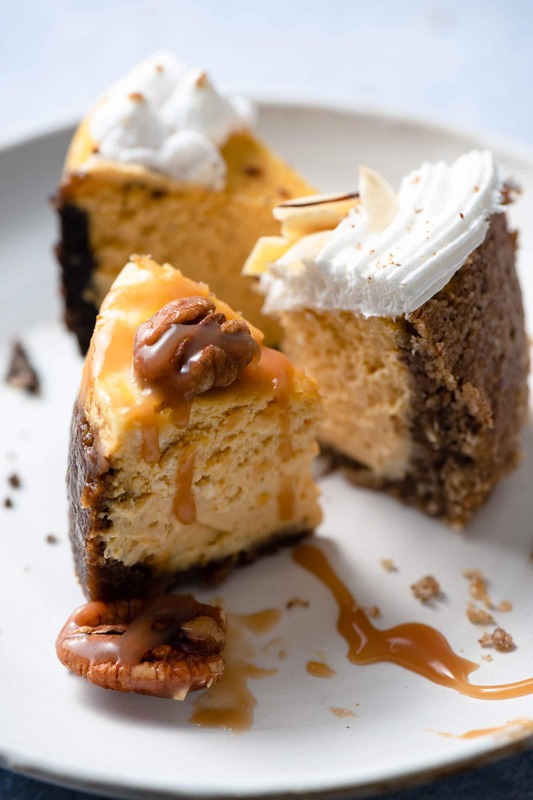 Top each cheesecake with toppings and serve chilled! Store Cheesecake in an air tight container in the fridge for 5-6 days. Or freeze for 6-8 months. 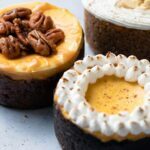 I love the idea of all these different cheesecakes! How to do pick just one to eat, I think I would have to sample them all! Hi Karly! Thank you! I totally ate some of all three! !